Financial technology has made immense strides in the past decade, bringing new levels of convenience to the consumer and corporate markets. App developers are disrupting the financial industry while also supporting the anti-money laundering regulations of federal and international bodies. These laws place the onus on service providers to be mindful of its participation in the movement of funds to curb criminal activity. As a result, they must perform adequate due diligence on their client bases. Thankfully, there are emerging and trustworthy products that enhance security, ensure compliance and aid in the overall effectiveness of these new financial innovations through Fintech compliance consulting. For those living in primarily cash economies, mobile banking promised greater financial participation and a way out of poverty. Mobile banking provided one way for individuals to save and transfer money electronically instead of relying on cash. While the risk for money-laundering was less with mobile banking compared to cash, it also was a potential gateway for actors to move funds used for illicit purposes. Lyons’ account verification services can ensure accounts linked to mobile are valid and that the account holder does not appear on a Treasury Department Specially Designated Nationals and Blocked Persons List. Peer-to-peer apps provide a new way for people to transfer money to one another. They represent another step forward in replacing cash, but they come with limitations. These apps are attached to traditional banking instruments and peer-to-peer movement is only possible for movement of a limited amount of funds. Money transfer apps are usually considered money service businesses for the purposes of the U.S. Treasury’s Financial Crimes Enforcement Network, and therefore subject to anti-money laundering laws. Part of the app’s obligation is to demonstrate compliance with AML, which can be accomplished by making use of Lyons’ patriotAGENT services. Cyber security is a growing concern in our modern, interconnected world. The digital means by which organizations communicate across the globe are also the same means by which bad actors engage in terrorist and criminal activity. By fighting back against cyber threats, security experts are helping to stem the flow of the proceeds and tools of crime across international borders. 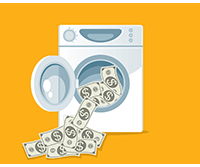 Anti-money laundering tools, such as the OFAC screening services, can help organizations to identify whether they are inadvertently doing business with anyone who is listed on the U.S. Treasury Department’s OFAC Sanctions List. Most people think of Bitcoin when they envision cryptocurrency, but there are many different coins associated with this new kind of digital exchange. Ethereum, Ripple and Monero are three other examples. While cryptocurrency is touted as a way to facilitate the movement of funds across international borders via a transparent and secure network — blockchain — experts insist cryptocurrency should also require customer identification. Last year the president of the Financial Action Task Force, which spearheads AML efforts globally, said that blockchain does not eliminate the need for financial institutions to perform customer due diligence. Routing number verification and OFAC screening services can help with these Fintech compliance obligations. Ensuring adherence to AML is essential to allow financial technology companies to continue innovating. Contact Lyons today to discover how our products and services can help you offer security to your end users and reduce the risk of noncompliance to your organization.